Got questions? We’ll do our best to answer them here. If we did not answer your question, you may contact any of our coaches directly via phone, email, or through our CONTACT page. This is a question that can best be answered by coming to BrewCity CrossFit and seeing what it’s all about in person. CrossFit is a strength and conditioning program developed by Greg Glassman and staff at CrossFit HQ. The CrossFit methodology seeks to achieve proficiency in each of 10 fitness domains: Cardiovascular/Respiratory Endurance, Stamina, Strength, Flexibility, Power, Speed, Agility, Balance, Coordination and Accuracy. 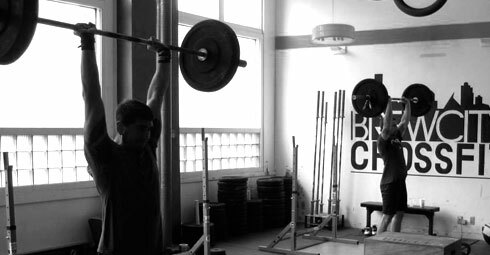 CrossFitters seek to achieve fitness by increasing work capacity across each of these domains. 02.Is a 20-minute workout enough? Yes, it is. More and more research shows that shorter duration/higher intensity workouts yield greater benefits and better results. Basically, it just boils down to hard work. The truth is that the longer we work out, the lower our intensity becomes. If you run 10 miles your intensity (power output) will be lower than if you run multiple 400 meter sprints. BrewCity CrossFit does sometimes go beyond 20 minutes, but the majority of our workouts take less time than that. Some of our favorites last as little as 5 minutes! 03.Is this the right program for me if I don't want to get too big and bulky? We don’t want you to get too big and bulky either. In order for people to get bigger, especially women, there are two things that you need to do: lift very heavy weights, very often, and eat a very high calorie diet. We do not do or advocate either of these things. But if you don’t believe us, we’ll make a deal with you: if you start to get too big, let us know and we’ll change your programming. (Note: we’ve never had to change our programming). You can injure yourself in any activity, but CrossFit is safer than most other athletic activities. In order to be safe, we like to work with people in 3 stages. First: MECHANICS (learning how to do the movements with correct technique). Second: CONSISTENCY (the ability to do the movements over and over again with safe and relatively efficient technique). Third: INTENSITY (the speed at which you do the movements). By stressing proper mechanics in the beginning, we reduce the risk of injury in the long run. 05.Do I need to be in good shape before I start? This is a common misconception. No matter what kind of shape you’re in, we can scale the exercises so that the workout of the day fits your ability. The most elite athlete can come into the gym and find a workout challenging. You will never be “fit enough.” That’s why we offer scaling options for each individual so that you can thrive in every workout on a personal level. Fitness is a lifelong journey. When you reach a goal, that just means it’s time to set a new one. 06.Why does it cost more than franchise gyms with TVs and elliptical machines? Our main product is our CrossFit group classes. Our rates are actually less expensive than many other group led workout programs in the area. The reality is that what you are getting at BrewCity CrossFit is more akin to personal training than it is to a standard franchise gym, at a fraction of the cost.